Our lives are filled with hundreds of decisions we have to make every single day. Sometimes we have time to think through these decisions, other times we have to make them on the fly. The life of a manager is no different. As a manager, you are bombarded daily with hundreds of requests, issues with employees, and important decisions that need to be made. How you handle all of these can greatly affect the happiness of your employees, which directly correlates to the turnover rate you will have. We all make mistakes at times. 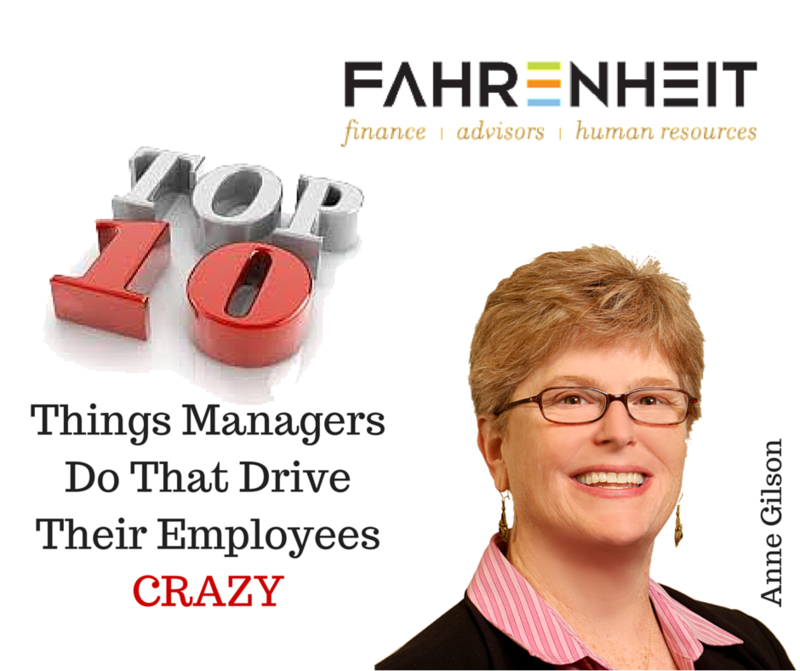 The following is a list of the Top 10 Things Managers Do That Drive Their Employees Crazy. If you have ever found yourself guilty of committing any of these “sins,” you should consider the effects of those actions and figure out ways you could handle these situations differently in the future. 10. Give raises that are virtually meaningless. 9. Give insincere, gratuitous “thank-you’s” and pats on the back. 8. Throw people into jobs they’re not trained for, or qualified to do. 7. Allow the workplace to be disorganized, cluttered, or dirty. 6. Share the stress of a visit from Headquarters with the whole staff. 5. Answer questions with, “Because I said so”–or another answer that reflects that attitude. 4. Overlook unacceptable behavior from staff members. 3. Ignore employee opinions and ideas. 2. Fail to give feedback and regular performance reviews. Now you’ve seen the list, so the question you might ask yourself is, “do any of these resonate?” If so, what actions will you take today to begin to shift your behaviors? I suggest you take one–yes, just one, item on this list and think about where you are and where you’d like to be. Take small, intentional steps, one action at a time. Monitor your success at the end of each week. When you have shifted to a new habit, you can look at another item as potential for changing your behaviors. All managers have done these top (or should we say bottom) 10 at some point. You can change, if you are intentional AND monitor your successes. The key is maintaining balance, ensuring employees feel valued, and most importantly, setting everyone up for success, because the more success you have in leading your employees, the more successful your company will be.